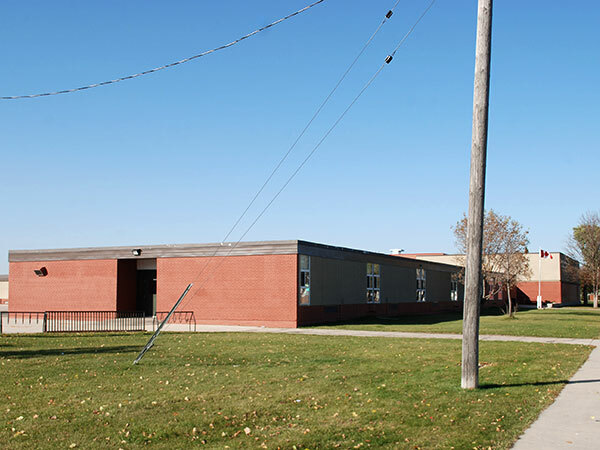 Located in the Transcona School District and later the Transcona-Springfield School Division, the tenders originally called for a ten-classroom school to be built on the designs of Winnipeg architectural firm of Prain and Ward. With construction underway by July 1957, a “name the school” contest was held. The winning entry commemorated explorer and fur-trader Pierre-Esprit Radisson. The eight-room school opened officially on 25 October 1957. It was expanded in 1960 on designs by Ward and Macdonald, with ten new classrooms and an assembly room. Additional capacity and an auditorium was added on the north side of the school in 1970-1971. As of 2014, the school hosts classes in Kindergarten to grade 5. “Seeks Liberal nomination in Radisson,” Winnipeg Free Press, 8 March 1957, page 6. “Transcona notes,” Winnipeg Free Press, 4 May 1957, page 10. “Transcona notes,” Winnipeg Free Press, 27 July 1957, page 12. “Transcona notes,” Winnipeg Free Press, 5 October 1957, page 46. “Transcona notes,” Winnipeg Free Press, 19 October 1957, page 5. “Transcona H and S,” Winnipeg Free Press, 23 October 1957, page 3. “Rip Van Winkle sheer delight,” Winnipeg Free Press, 29 May 1970, page 9. “Push-button arithmetic - help or hindrance?,” Winnipeg Free Press, 4 September 1975, page 17. “Transcona-Springfield School Division No. 12,” Winnipeg Free Press, 26 August 1993, page C10. “Students speak out against vandals after school tagger,” Winnipeg Free Press, 3 May 2008, page B6.